Prince Nico Mbarga poured joy into his music, including the most popular song in African history. But his own story has never been told — until now. Twenty years ago the man who recorded one of the most successful songs of all time was thrown off a motorbike by a car in Calabar, Nigeria. He hit his head on the road and was rushed to the hospital, where he lay for two weeks, in and out of consciousness, but deteriorating all the time. On June 24, 1997, Prince Nico Mbarga was pronounced dead. “Sweet Mother,” his 1976 one-hit wonder, had sold at least thirteen million copies across the African continent – more than The Beatles’ bestseller “I Want to Hold Your Hand.” But no global media outlet thought to cover the life and death of the artist behind Africa’s most popular song. Today, the only internet accounts of his life reach around four paragraphs and bookend Mbarga’s career with two big political events of the time: the Biafran War in 1967 that saw him, at 17, flee across the border to Cameroon, where he mastered the guitar; and the expulsion of undocumented migrants from Nigeria in 1983, with his band’s Cameroonian members among the two million West Africans forced to leave the country. Politics, however, rarely frames lives quite so neatly. narrative.ly traveled to Mbarga’s hometown to talk to his childhood friend, his wife and his mistress; tracking down his former band members from Cameroon to France to the US; prodding the memory of his octogenarian producer; and reading rare transcripts of his interviews. Nico Mbarga’s best friend Ojong, left, and Mbarga’s widow, Esame, right. Twenty years after his death, this is the obituary that never was. The first place Mbarga knew, the town of Ikom was the last stop on my journey. In a modest bungalow there I met Esame, his widow, and Ojong, his best friend, on a warm evening on the cusp of the wet season. On plastic chairs in the shadow of his mausoleum, they told me about Nico Mbarga and the place he called home. The son of a Cameroonian father and a Nigerian mother, Nico Mbarga was born in nearby Abakaliki on April 8, 1950, but grew up in Ikom. In the 1950s it was little more than a series of administrative buildings, houses and farms clumped around Cross River, surrounded by tropical rainforest, right on Nigeria’s eastern border with Cameroon. Today Ikom is still fairly remote – the tarmac roads coming in and out quickly crumble into dirt – but back then it was positively isolated. The only way goods such as bicycles and sewing machines made their way to the village was by lighters on the river from Calabar, more than 100 miles to the south. But even in rural Ikom, all the flux of being in a British colony in Africa in the mid-twentieth century – and the trappings of modernity it entailed – had its effect. In Ikom, Mbarga is newly remembered by a statue erected early this year. It’s a golden Mbarga in his platform shoes, standing his guitar on a plinth, looking out over the traffic of “Mbarga Junction.” Nearby, shaded by Ikom’s many red-blossomed African tulip trees, is Sweet Mother Road. 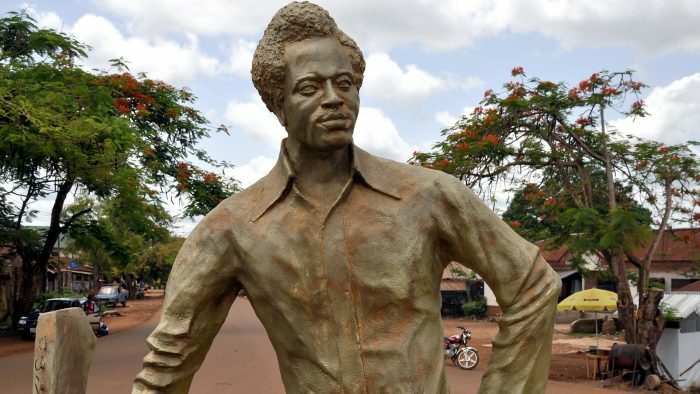 And if it is sad in a sense – Lucy cried the day the statue was put up, as if it were final confirmation of his death – it does at least constitute a well-earned recognition for Mbarga at last. Which leaves just one final question: Why have Mbarga and “Sweet Mother” been so ignored elsewhere? While the continent’s cultural contributions are generally marginalized, some African music does make it outside, from Fela Kuti’s afrobeats, to Ali Farka Toure’s Malian blues, to Ethiopia’s otherworldly-sounding jazz. The music that makes it to western ears is usually tough and cool, if not explicitly political, reflective of what many perceive must be a dark political mood. Yet none of this music, brilliant and rich as it is, has proved as popular with Africans themselves as Prince Nico Mbarga and Rocafil Jazz’s ten-minute ode to mothers. It is played at weddings, as newlywed brides about to leave their homes for the first time dance with their mums to say thank you, at birthday parties celebrating the long lives of family grandmothers, and at Mother’s Day church services, the only secular song amongst the hymns, with worshippers swinging in the aisles adding their own “hallelujah!” to Mbarga’s lyrics. The “Sweet Mother” ideal, the all-consuming mother, not eating until her children are fed, not sleeping until they sleep, crying when they are sick, might be a little conservative, but it has deep cultural roots.